Unlimited style options. If you want to incorporate the visual effect of wood into your bathroom flooring or backsplash, you can achieve this with bathroom porcelain tiles. You have unlimited choices of patterns and styles from natural stone, wood-like and even textured fabric. 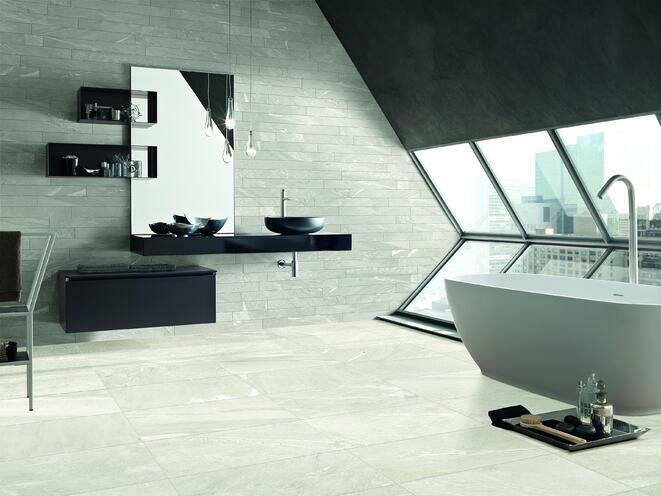 Limestone or granite inspired porcelain tiles are available, as well as Beachwood and even cement/industrial style to give your bathroom sophisticated and modern edge. They are denser. This means they are less likely to trap in moisture and there is less likelihood of dirt and grime buildup on the tiles. And there’s less chance of mold and mildew growth. Mold and mildew love warm and moist places. Swimming pool owners opt for porcelain tiles for their pools because of durability and denseness. Bathroom porcelain tiles are easier to maintain than natural stones or other naturally sourced materials. Wood-like tiles have achieved the look or visual texture of wood grain without the nuances of maintaining a wooden floor. Porcelain wood like tiles bring to the bathroom the natural look or sense of nature. Pair this with a few indoor plants and you’ve brought in the outdoors into your bath. The same effect comes with natural stones. The envisioned tactile feel of stone is mimicked by the tiles. Yet they are easier to clean with just clean cloth, mild anti-bacterial detergent and water. Color and visual tactile effects of the bathroom porcelain tiles run all the way through the tiles. This helps in camouflaging chips and scratches. Porcelain tiles go through the technology that makes them stronger and tougher all through different wear and tear and human or even pet traffic. They do not go through the process of glazing. Their pristine beauty comes out naturally and doesn’t wear off easily. Bathroom porcelain tiles are the best option for your bathroom floor. And the variety of styles will keep your creative mind flowing on the design you want to achieve for your space. To guide you through the design phase of bathroom renovation, visit galleriastone.com. Or visit them at (address) and let the design team walk you through different options.